Associated Press reports that Prince William and Kate have surprised hundreds of fans with a visit that was not in their schedule to the streets of Quebec. The royal couple visited the city that was a key victory against the French. The historical event was not forgotten by the French-speaking separatists who were protesting nearby. It was on the fourth day of their scheduled 9 days around Canada, when William and Kate had a private lunch at the Citadelle, the place where, in 1759, the British raised the flag of victory against the French in the Battle of Quebec. The fortified residence was the symbol of England conquering the New France. The royal couple encountered protesting problems since their second day of the trip in Canada. Miguel Head, the representative of the The Duke and Duchess of Cambridge said that the protestants haven’t made the couple change their feelings towards the country: “What they’ve seen in Quebec, in Montreal the last two days is, for them, just part of the rich fabric of Canada and in no way detracts from how much they respect and admire the country”. On the contrary, he said that the couple has been impressed by the hospitality they have been received with. They’ve very much fallen in love with the country,” he continued. The protesters in downtown Quebec were about 200. They had black flags that they were waving. Their demonstration was only two blocks away from the place the couple was visiting. 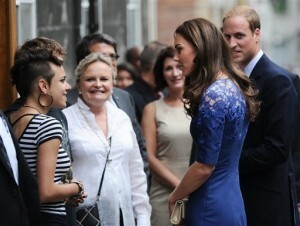 Then the royal couple went for a walkabout, greeting the people in the streets. They greeted and shook hand with the citizens.